One of my favorite little additions to a meal is (semi)homemade biscuits. 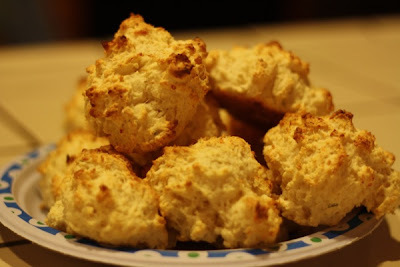 I use a recipe out of my Bisquick Cookbook that Steve's mom got me for my birthday last year. It is a great cookbook to go along with a Costco size box of Bisquick. Tonight I made the bisquick biscuits to go along with a salad for dinner. They take about 5 minutes to prepare and 10 minutes to bake, so they are the perfect quick addition to any meal to give it that special cozy touch! Heat oven to 450F. In a medium bowl, stir Bisquick mix, cheese, milk, and 1/2 teaspoon of rosemary until soft dough forms. On ungreased cookie sheet, drop dough by the spoonfull.